Logic gate circuits are designed to input and output only two types of signals: "high" (1) and "low" (0), as represented by a variable voltage: full power supply voltage for a "high" state and zero voltage for a "low" state. In a perfect world, all logic circuit signals would exist at these extreme voltage limits, and never deviate from them (i.e., less than full voltage for a "high," or more than zero voltage for a "low"). 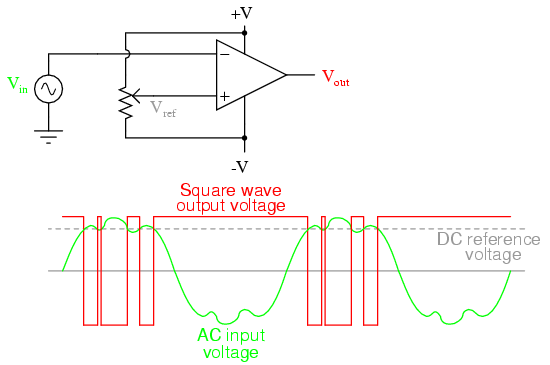 However, in reality, logic signal voltage levels rarely attain these perfect limits due to stray voltage drops in the transistor circuitry, and so we must understand the signal level limitations of gate circuits as they try to interpret signal voltages lying somewhere between full supply voltage and zero. If a voltage signal ranging between 0.8 volts and 2 volts were to be sent into the input of a TTL gate, there would be no certain response from the gate. Such a signal would be considered uncertain, and no logic gate manufacturer would guarantee how their gate circuit would interpret such a signal. 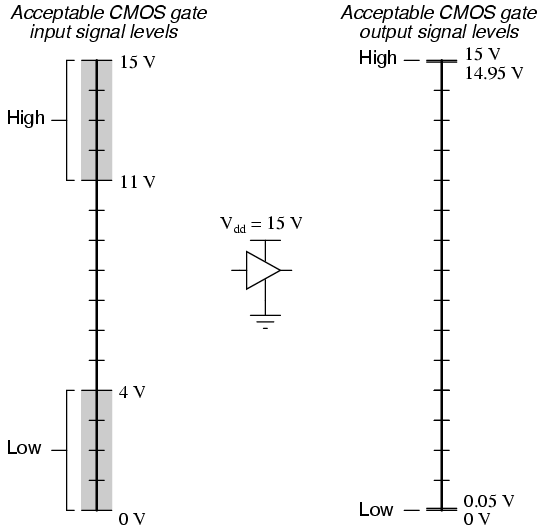 It should be obvious from these figures that CMOS gate circuits have far greater noise margins than TTL: 1.45 volts for CMOS low-level and high-level margins, versus a maximum of 0.7 volts for TTL. 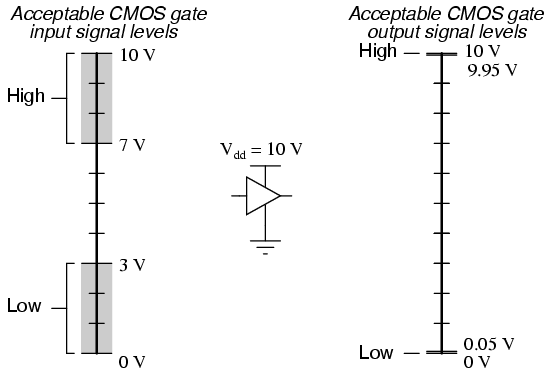 In other words, CMOS circuits can tolerate over twice the amount of superimposed "noise" voltage on their input lines before signal interpretation errors will result. The margins for acceptable "high" and "low" signals may be greater than what is shown in the previous illustrations. What is shown represents "worst-case" input signal performance, based on manufacturer's specifications. In practice, it may be found that a gate circuit will tolerate "high" signals of considerably less voltage and "low" signals of considerably greater voltage than those specified here. Conversely, the extremely small output margins shown -- guaranteeing output states for "high" and "low" signals to within 0.05 volts of the power supply "rails" -- are optimistic. Such "solid" output voltage levels will be true only for conditions of minimum loading. If the gate is sourcing or sinking substantial current to a load, the output voltage will not be able to maintain these optimum levels, due to internal channel resistance of the gate's final output MOSFETs. Schmitt trigger gates are distinguished in schematic diagrams by the small "hysteresis" symbol drawn within them, reminiscent of the B-H curve for a ferromagnetic material. Hysteresis engendered by positive feedback within the gate circuitry adds an additional level of noise immunity to the gate's performance. 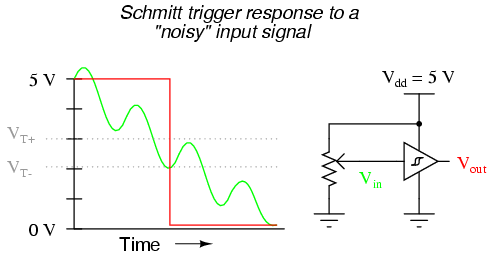 Schmitt trigger gates are frequently used in applications where noise is expected on the input signal line(s), and/or where an erratic output would be very detrimental to system performance. 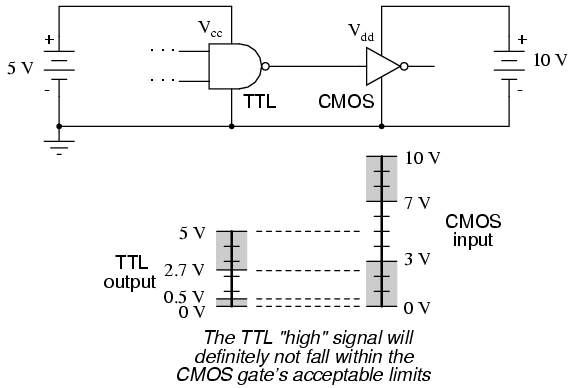 The differing voltage level requirements of TTL and CMOS technology present problems when the two types of gates are used in the same system. Although operating CMOS gates on the same 5.00 volt power supply voltage required by the TTL gates is no problem, TTL output voltage levels will not be compatible with CMOS input voltage requirements. 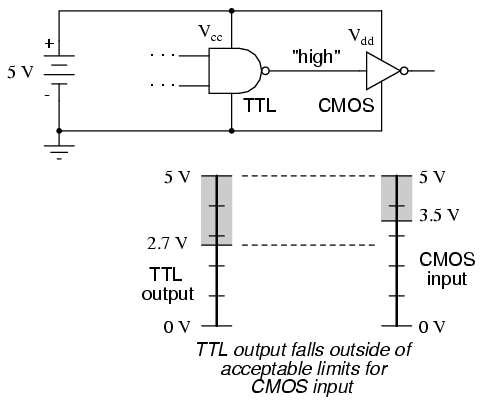 Due to the excellent output voltage characteristics of CMOS gates, there is typically no problem connecting a CMOS output to a TTL input. 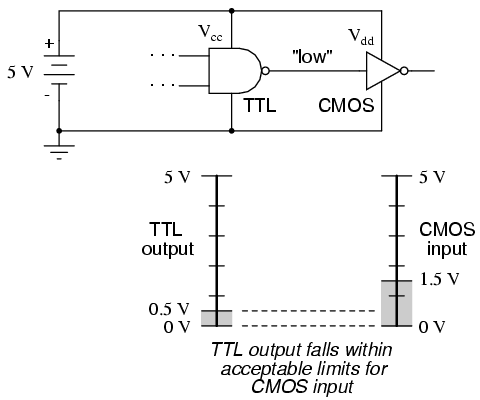 The only significant issue is the current loading presented by the TTL inputs, since the CMOS output must sink current for each of the TTL inputs while in the "low" state. 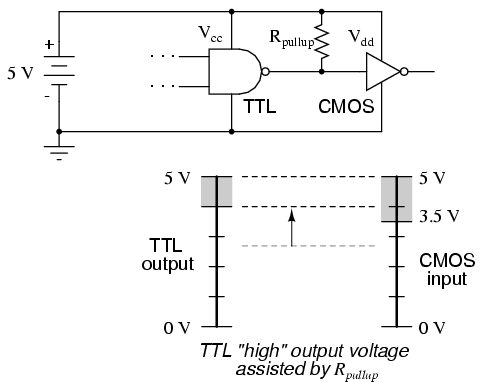 The "Rpullup" resistor is optional, since TTL inputs automatically assume a "high" state when left floating, which is what will happen when the CMOS gate output is "low" and the transistor cuts off. 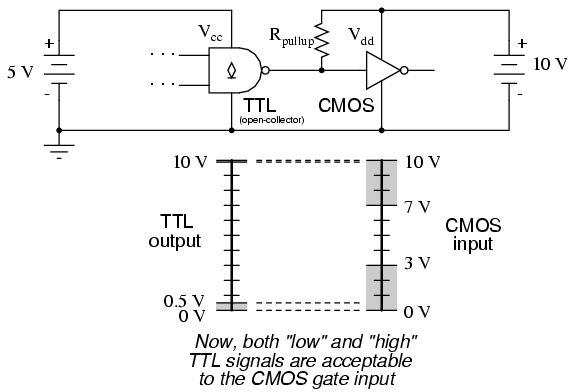 Of course, one very important consequence of implementing this solution is the logical inversion created by the transistor: when the CMOS gate outputs a "low" signal, the TTL gate sees a "high" input; and when the CMOS gate outputs a "high" signal, the transistor saturates and the TTL gate sees a "low" input. So long as this inversion is accounted for in the logical scheme of the system, all will be well.